One of Harrods bestselling gift items has to be their vast collection of shopper bags. It seems that every woman, whether resident or tourist that passes the through the iconic department store has to come away with one or more of those famous shopper bags that bears the chic Harrods signature logo. With sizes that range from the nifty pocket size which fits perfectly into your handbag until you actually need it, to mini, small, medium and large sizes, and prices that start at a mere £6,95 up to £45, these shopper bags can make an excellent gift choice for Christmas or for any type of gift giving occasion. Besides the classic shopper in black and bearing the gold Harrods signature that everyone has seen at one point or another, there are still literally dozens of other designs and colors to choose from. Let’s check out some of more unusual offerings in the shopper bag line that Harrods has for this 2013. If you like glitter you definitely want the shopper bag where the Harrods signature is embellished with dazzling pink Swarovski crystals and also features a detachable pink bow and logo plaque. Too much for a simple shopper? You can go with the Scottish tartan designin green, red, gold and blue or if you’re a canine lover, how about the design that has a cute West Highland Terrier that adorns the bag? 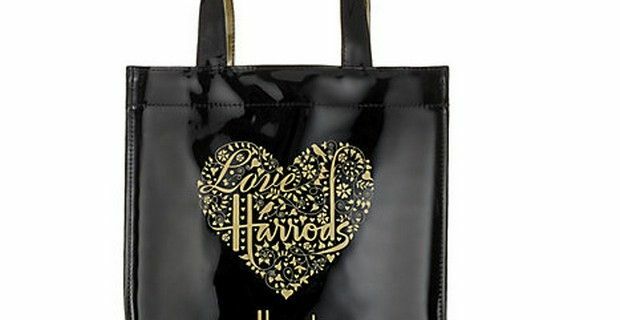 If you adore the dynamic city of London and need to prove it to the world, there’s the ‘Love London, love Harrods’ black PVC shopper bag. The front has a clever cut-out motif that allows the glittery pink backing behind to shine through or you can go with the boldly colorful London Icons print that features everything from the Big Ben to the Tower of London. Harrods has also released in limited edition a unique and chic looking gold-tone Love Harrods heart design of their signature shopper.